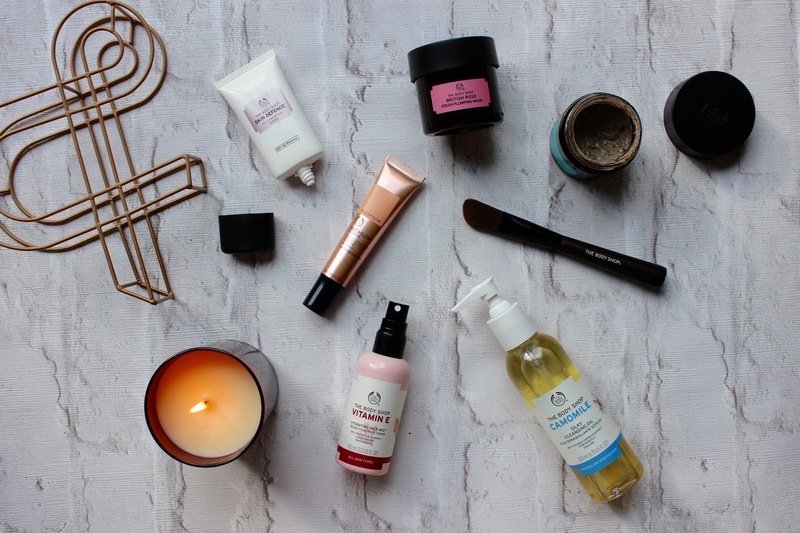 One of those brands I've loved and trusted for years - see this post for me rambling on about the excitement I felt when I got to go to one of their parties aged ten - is The Body Shop, and recently I've been loving so many items from them that I just had to sit down, grab a cup of tea and start typing this blog post. Some things are too good not to share! Kicking things off with a skincare love of mine that has featured in countless posts and videos - even making it into My Favourite Beauty Products of 2015 video - is the Camomile Silky Cleansing Oil (£10). Originally an Amelia Liana inspired purchase, this is my weapon of choice for removing makeup in the evening as it easily dissolves the heaviest of full-coverage foundations and gently melts the most waterproof of mascaras without stripping your skin. It feels the opposite, in fact; we're talking a seriously baby-soft, nourished and protected complexion. Although I was a fan of the built-in pump it used to leak like an old tap which was quite annoying, but they've changed the packaging and I can happily confirm that this issue has now been resolved! Another classic product that has had a packaging revamp is the Vitamin E Hydrating Face Mist (£9.50) which still has that nostalgic feel but with a modern twist, and I'm utterly obsessed with it. I know I use that word all the time, but how else would you describe physically not being able to walk past a product without picking it up and liberally spraying it across your entire face? Designed to instantly refresh and boost hydration levels, I've been keeping this baby on my dressing table but I'd be lying if I said that I don't move it from room to room with me as well. For example, right now it's on my desk as I write because all you need is a couple of spritzes and your skin feels calmed and soothed within seconds. I often find that some face sprays don't really 'do' much, whereas this one really does moisturise and has a heavenly soft rose scent. Speaking of divine scents, the newly launched Spa Of The World Hawaiian Kukui Scented Candle (£15) is an absolute gem. I've been raving about How To Make Your Home Smell Like Paradise recently, and this is another fragrance that transports you to a desert island before you've even lit it. The packaging looks and feels triple its actual price and I find the candle itself to burn extremely well, emitting the most gorgeously warm and inviting scent. It reminds me of a beach holiday whilst simultaneously making me excited for the festive season which is an interesting mix that I thoroughly enjoy, and I definitely need to pick myself up the matching body butter. If you're a beauty lover you've no doubt heard of multi-masking and The Body Shop have definitely hit the nail on the head with this trend, the idea of which is that you can deal with multiple skin issues at the same time by applying different masks to certain areas of your face. The combination I've found to be most beneficial is the Himalayan Charcoal Purifying Glow Mask (£15) on my t-zone to draw out impurities and minimise pores, and the British Rose Fresh Plumping Mask (£15) on my cheeks to hydrate and soften. You apply these with their facial brush which is a lot of fun (even Will joined in with my pamper evening when he spotted me painting my face in the bathroom) and the results are fab. Another skincare item that has been keeping my skin happy is the Skin Defence Multi-Protection Essence (£18), something I hadn't heard of until recently and am now a firm fan of. With the extremely photogenic packaging aside, the product itself is an extremely lightweight and fast-absorbing lotion that sinks into the skin immediately and provides a beautiful base for makeup as well as offering SPF50 UVA and UVB protection. I recently went away to Manchester for a shoot and left my moisturiser at Will's but didn't panic, as I found this in my makeup bag and knew it'd perfectly hydrate and soothe my skin both AM and PM which is definitely a positive testament as to how good it is! Finally, a product I've been seeing all over Instagram is the Instaglow CC Cream in 'Peachy Glow' (£14) which I've been using almost every day either under my makeup or mixed into my foundation. Both methods quickly and easily perk up the complexion and 'lift' the skin, making you look wonderfully glowy and in a word: healthy. As the seasons change from summer to autumn I often find that my skin can look a little lacklustre, and this is the ideal product for counteracting dullness and injecting a nice dose of sunshine!